Lycoming College celebrated the grand opening of the Lycoming College Art Gallery, 25 West Fourth Street, in downtown Williamsport last week. The opening exhibition, on display until Nov. 22, features the private collection of Barbara and Leonard Sylk. Barbara Sylk is a Lycoming College art alumni and is trustee of the college. Sylk and her husband Leonard, are well known for their extensive collection of Pennsylvania artists, including Bo Bartlett, Thomas Chimes, Elizabeth Osbourne, Sidney Goodman, Neysa Grassi, and Jimmy Lueders. Taken together, the pieces exhibited show a range of responses to the natural world, both figurative and abstract. President Kent C. Trachte, welcomed Lycoming College trustees Barbara Sylk, Hugh Sides, Frank Pellegrino and Dr. Robert Shangraw (emeritus). In addition, the event attracted several dignitaries including Williamsport Mayor Gabe Campana; President Davie Jane Gilmour, Pennsylvania College of Technology; State Representative Rick Mirabito; County Commissioner Tony Mussare; and Vice President of the Lycoming County Celebrates the Arts Alliance, Judy Olinsky. The gallery provides a unique experience for Lycoming art students, who have the opportunity to interact with visiting artists and be a part of the set-up, arrangement and tear down of all exhibitions. Students who assisted with the exhibit of the Barbara and Leonard Sylk Collection include: Danielle Grega, Tenninger Kellenbarger, Charles Marshall, Kelsey Rawson, Rachel Salmon, Sarah Sipe and Taylor Toczylousky. The Lycoming College Art Gallery features four or five regional or national exhibitions plus the Faculty Show and Senior Show annually. The next exhibit will be the Faculty Show, from Dec. 5 – Dec. 19, featuring a reception and gallery talk on Friday, Dec. 5 from 8-10 p.m. This event will be free and open to the public. For more information on the Lycoming College Art Gallery opening, please watch WBRE’s coverage of the event. 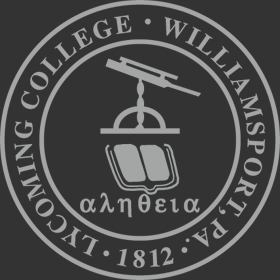 For more information on the Lycoming College Art Gallery and the upcoming exhibitions, please visit the Lycoming College Art Gallery Web page. President Kent C. Trachte speaking to the guests at the grand opening. The students who assisted in setting up and arranging the opening exhibition. President Kent C. Trachte with board members and the art faculty members at the opening. The view of the gallery from West Fourth Street.